Some nights it’s like a zoo out there in the orchard. Last night was one of the first warm nights of the spring season and the wind was blowing strongly with the air that had collected over the warm deserts in the centre of the continent. A late wind change was expected which then brings cooler moist air in from the oceans to the south of the continent. The animals just know that rain was expected after the warmth. Of all the animals here, the wombats are the most sensible. In another story they’d probably be hobbits living in their underground houses waiting until conditions were just right before poking their noses out to see what was going on around them. Certainly they’d avoid adventure! And if it was raining, well that would be just another good excuse for an extra bit of disco nap time. Still, wombats like their food too, so if rain is on the weather radar, they’ll quickly nick down to the shop for a quick bite whilst it’s still light before heading back to bed again. Last night was one of those rare nights here, when all of the native animals popped by at the same time for a quick snack just as dusk was setting in. 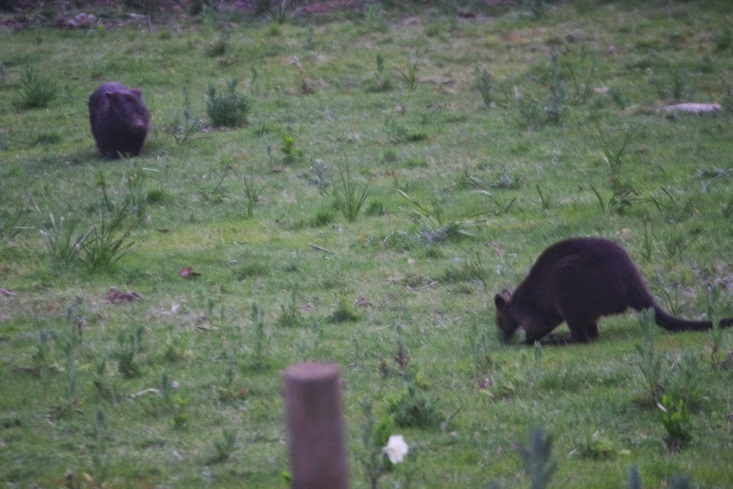 That’s a photo of Fatso, who is the boss wombat around here with his dodgy mate Stumpy the house wallaby. They’re both just on the other side of the new blackberry enclosure. From time to time a smaller wombat also visits the farm, called baby wombat – when Fatso isn’t around, of course – but that one is a bit skittish about being caught on Fatso’s turf, so he wasn’t there. Stumpy the house wallaby however, is around all of the time and he often bounces around in circles tiring out the dogs, who are all rightfully nervous about getting too close to Stumpy. I wrote that the magpies are the hardest working birds on the farm, because they simply are. The family of magpies will happily chase away the wedge tail eagles which would otherwise try and eat the chickens or even my small fox terrier dog, despite the fact that the magpies are tiny birds compared to the eagles. They also chase away the sulphur crested cockatoos which can cause so much damage to houses around here (as they’ll happily eat the timber windows etc.) as well as the fruit trees in the orchard. The local parrots are also fair game for the magpies too and this is a bit of luck as those parrots will happily eat any and all of the fruit in the orchard. However, recently the magpies have learned a new trick. They must have spotted me shooing the chickens away from scratching up the driveway. Within the last week or two, I’ve noticed that a magpie can occasionally stand as a sentinel guard near the driveway and dive bomb any chicken that dares come close to that area. It is uncanny, because they aren’t dive bombing me, just the chickens. The weather has turned much warmer over the past week or so and the rain, when it does arrive is much heavier. Last Thursday night the farm received a welcome 35mm (about 1.5 inches) of rain. In fact there was so much rain that the worms started seeking drier ground on the veranda tiles. 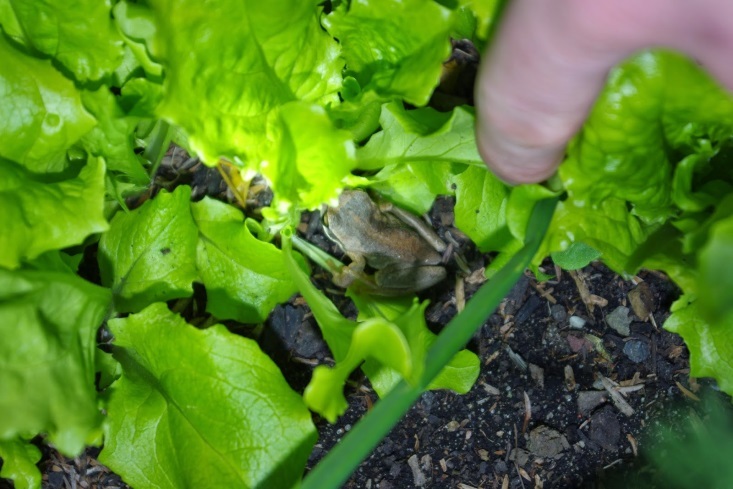 However, that didn’t quite explain how one of the local southern brown tree frogs was found sheltering under some of the Australian yellow lettuce in a raised garden bed. The excavation saga continued this week. A rich vein of rocks was discovered! Peak rocks, has been reached here at the farm, but the devastating effects of that can be put off for just that little bit longer due to the new find. The rock walls were extended and many large rocks were moved into their new positions just waiting for further excavated clay to be piled against them. In fact the entire area was cleaned up so that excavations could continue next week. You can even see a stack of saplings which will be used as palings for the fence around the blackberry enclosure. 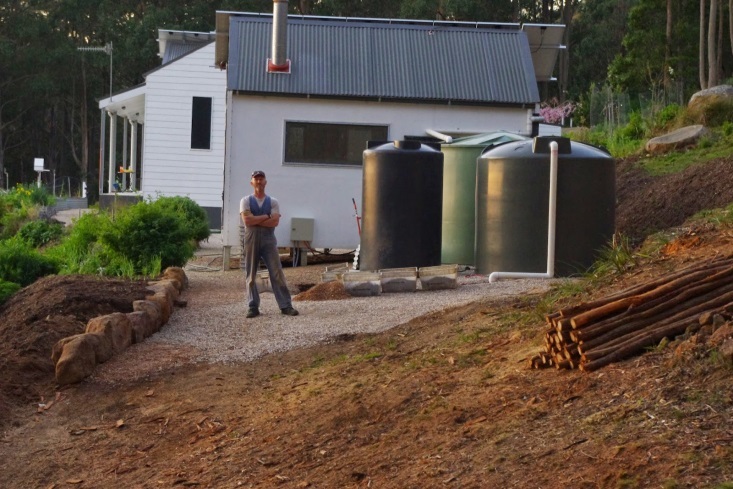 The photo above also shows that the overflows for the new water tanks have all been connected up during the week too. They are the white pipes hanging off the side of the new water tanks. This became a very critical task too as I had to connect all of the water tanks up in order to capture the very heavy rain last Thursday. All of those water tanks are now full. Connecting up the water tanks was no easy job and I’ve had to bury both the overflow pipes (white pipes) and the water pipes (black with a green stripe) which equalise the water heights between the three different water tanks. 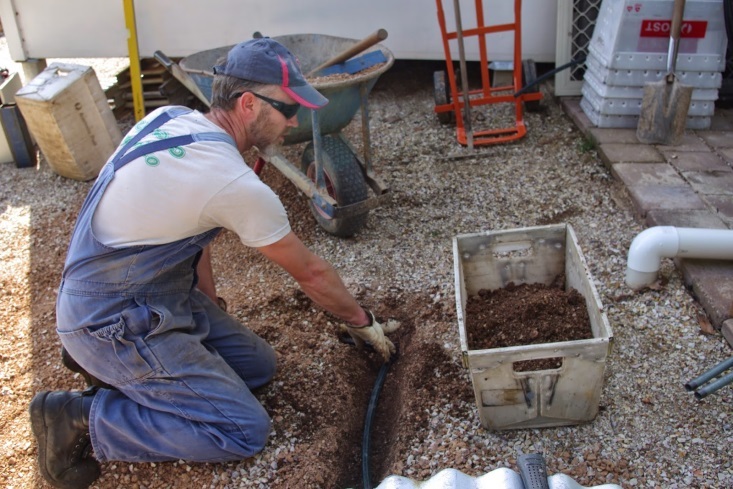 Burying the pipes is really important to ensure that they are not destroyed by the harsh UV sunlight over summer, but also to ensure that someone doesn’t accidentally trip over them and in the process waste many thousands of litres of water. 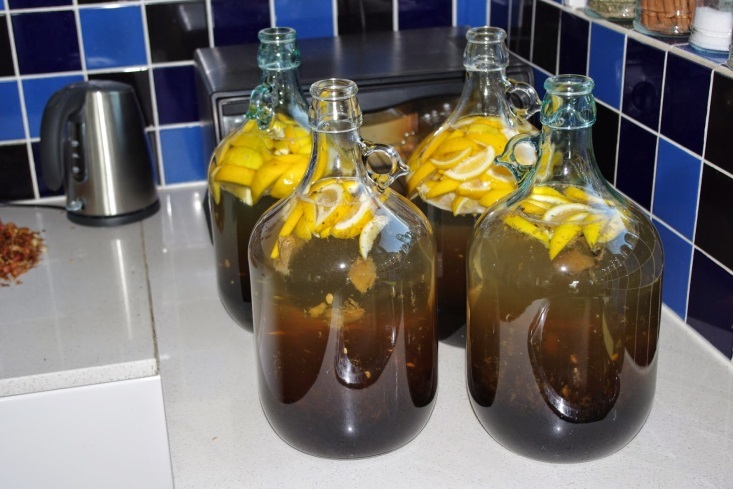 In breaking cooking news: Four demijohns of a lemon and ginger country wine were started this week. The next paragraph contains some naughty environmental concepts, so for those that are easily offended, please skip onto the next paragraph. With that disclaimer out of the way: Have I mentioned before that the house is powered 100% all year by 4.2kW of solar photovoltaic panels? 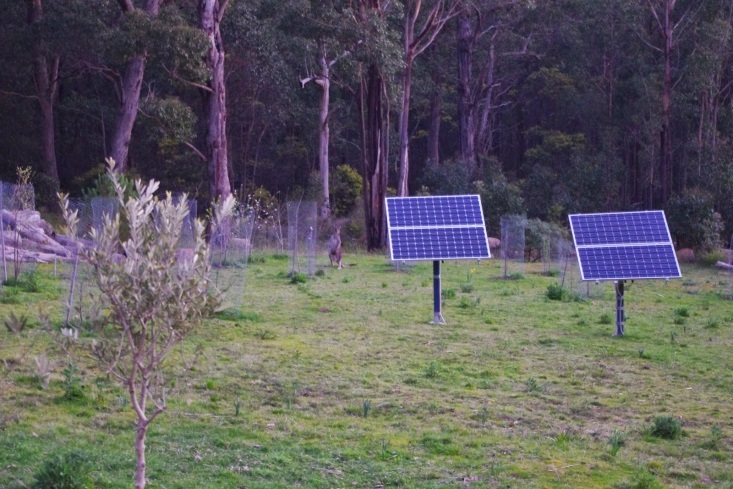 Well, it is not a really very efficient system because in order to get the household through the darkest days of winter using only solar power means that in all of the other seasons there is so much solar electricity I rarely know what to do with it all. It is simply way too expensive to connect up to the electricity grid, so I just have to keep coming up with new and inventive ways of using electricity whilst the sun is shining. This week, I found a new way to use electricity! It is very exciting too and it involves cooking toasted muesli in an electric oven. I’ve only ever cooked it before in the wood oven (total 100% YUM) and also the gas oven. 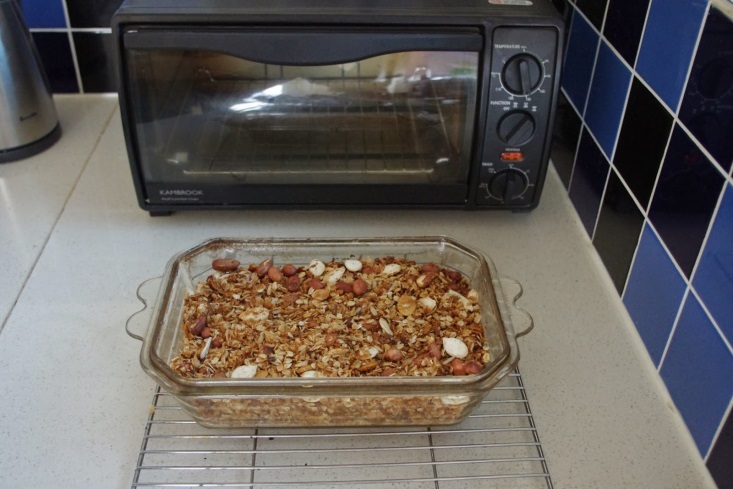 So with a bit of experimentation I can now state for the record that cooking the muesli in the photo below used 0.84kW/h of electricity. WOO HOO! Plus toasted muesli with no added salt or sugar is exceptionally yummy! 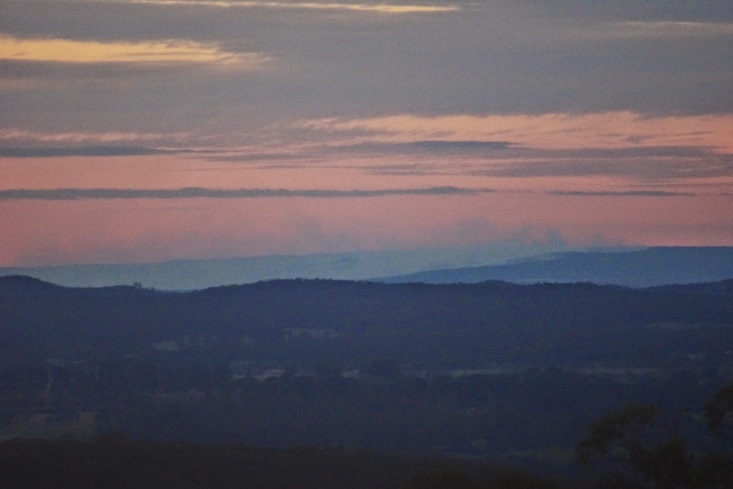 The government has been undertaking early back burning operations in the Brisbane Ranges to the south west of here last week, and the smoke from the fires produced the most amazing hay-fever and also red sunsets. The early almonds have grown substantially in the past week and I’m considering either netting some trees completely or hanging sparkly flash tape in order to scare away the local parrots who may otherwise decide to snack upon the ripening fruit. 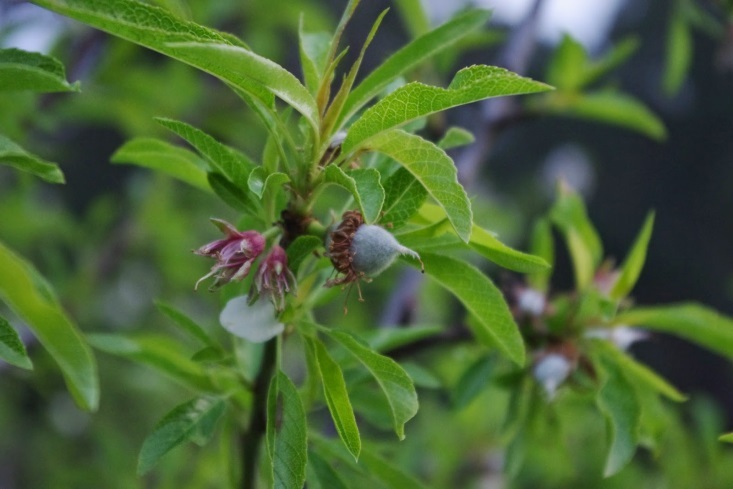 With such a diversity of fruit trees here (300), many haven’t yet broken their dormancy, whilst others have formed fruit. 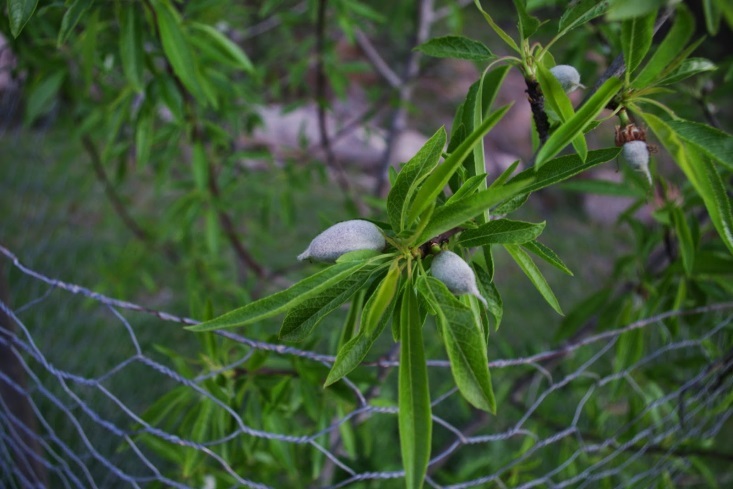 This week, I spotted that the early apricots have started to form fruit. It looks like it will be a bumper year here for apricots now that they have settled into their new sunny spot in the orchard. If experience has taught me anything, it is that apricots must be planted in the full sun, otherwise fruit set will be ordinary at best. As a final note, my trusty second hand and 10 year old Sony handycam finally decided that last night would be its final functional night on this planet and I’d really welcome any suggestions or recommendations for a dirt cheap video camera with a USB plug – new or used – with which to prepare YouTube videos for the blog. Thanks in advance for any advice or recommendations! This past week has been quite sunny weather with a single evening of very heavy rainfall. The temperature outside here at about 9.30pm is 12.8 degrees Celsius (55.0’F) and so far this year there has been 618.8mm (24.4 inches) of rainfall which is up from last week’s total of 583.4mm (23.0 inches). Some people dream of sports cars, whilst others dream of large houses and overseas holidays. I however dream of excavators. There are times here when a small 4 tonne excavator would be really handy. The skies have been mostly clear and sunny in the past week, so the excavations continued – all by hand of course (thus my dreams of a small excavator!). The excavations are however, creating a flat site for both a machinery shed and a small wood shed. It is amazing just how much clay material can be moved by hand from one location and placed in another over the course of a day. 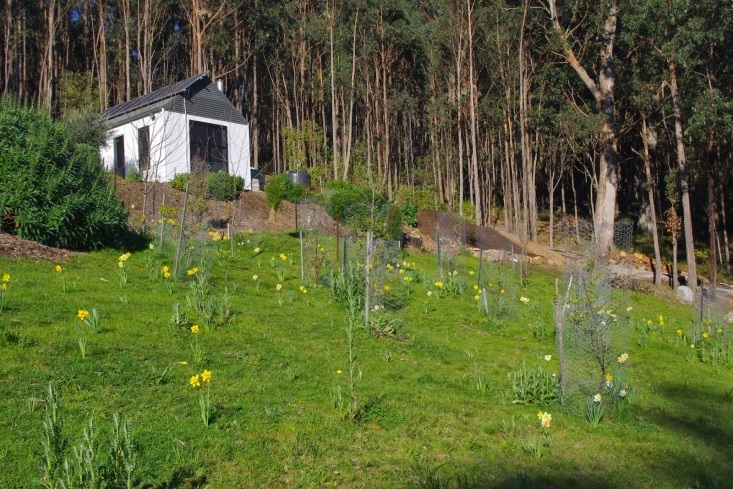 The farm is located on the side of a mountain, so any reasonably flat site has to be dug out of the side of the hill. The highest point the excavations are about a 1.8m (6 foot) drop from the natural soil level to the ground. All of that clay is being used to make new garden beds, so nothing is going to waste here and the new flat area is starting to look really good and expansive. 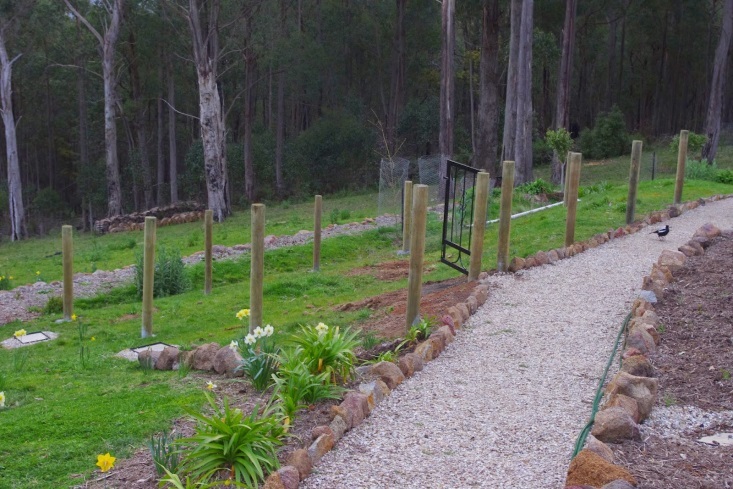 Rocks are used in these new garden beds as retaining walls. Many years ago, I got the idea for using the local rocks as a retaining wall after seeing that the historic hill station gardens in the area used their rocks this way. The best ideas are always other peoples and I had a lot of rocks about the farm and was wondering what to do with them, when it occurred to me that they were an untapped resource. Fast forward to today and with many hundreds of metres (feet) of rock walls about the place, rocks are in a bit of short supply now. I’m only really ever half joking when I suggest that the farm has hit peak rocks! Incidentally, the two rocks in the bottom left hand corner of the photo have now been rolled up hill to form part of that retaining wall. It was no easy feat because they certainly weigh more than I do. Oh yeah, an excavator would be really handy! I’d been thinking of ways to move some of the larger rocks about the place whilst I was reading the comments section in last week’s blog entry. Tip of the hat to Lewis, because he mentioned the origin of the term Skid Row which was actually a timber roadway that timber was skidded along back in the day, possibly pulled by bullock teams. 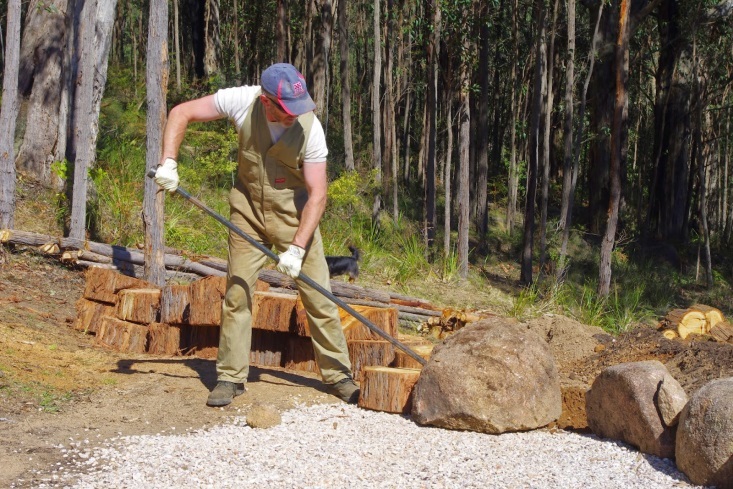 This got me thinking about how to roll a very large rock down the hill using timber as a guide rail. That is sort of important here because being on the side of a mountain, rocks which roll out of control down the hill can quickly gather momentum and squash fruit trees and even solar panels. Ouch! I’ve heard it said that with the right lever, you can move anything. We now interrupt this blog for an important chicken community service announcement. Pan the camera to the chicken enclosure where the author is sitting typing this week’s blog entry on a laptop with a somewhat surprised expression on his face. Beep (the actual words spoken have been censored due to legal advice)! 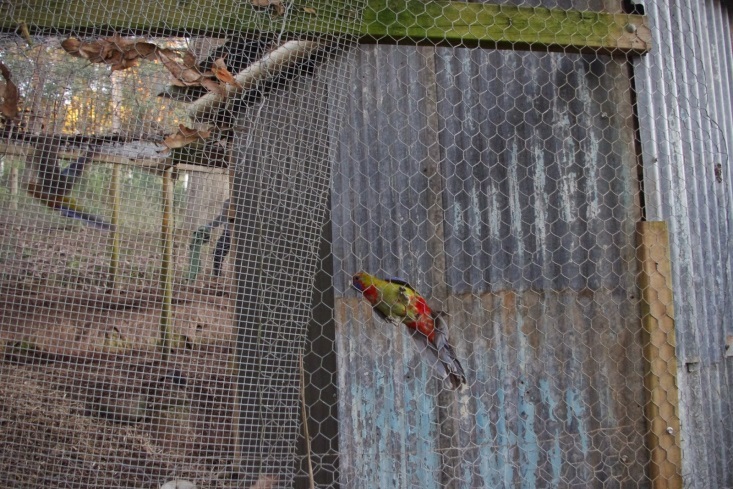 Right in front of me, two young local parrots attempted a smash and grab raid on the food in the chicken enclosure. I couldn’t believe it. All was going well for the two rapscallions and much food was quickly consumed. Unfortunately for the two mischief makers, their small brains didn’t quite provide them with the intellectual grunt needed to be able to navigate their way out of the enclosure again through the open door. A rescue operation was quickly mounted involving leather riggers gloves (very necessary as their beaks are lethal), eye protection and a towel (a very useful tool too, according to the Hitchhikers guide to the galaxy). They were easily apprehended because as they flew past in distress, I simply threw the towel (pun intended) on top of them. At that point the offenders were decamped to the east and thus were now outside of the chicken enclosure free to ponder the errors of their evil ways. Rosella being released. Not quite the white dove of peace! We now resume normal programming. What were we talking about? Oh yeah, more rocks and an excavator would be really handy. Earlier in the week, I also did what I call borage bombing an area. 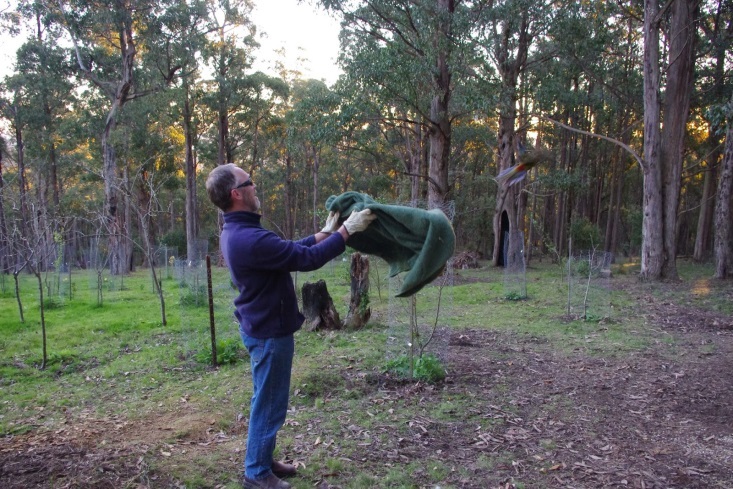 This involves removing almost a hundred cuttings at a time of the plants from a weed infested area of the forest and bringing them back here to act as companion plants, bee food, chicken feed and all round general soil conditioners. 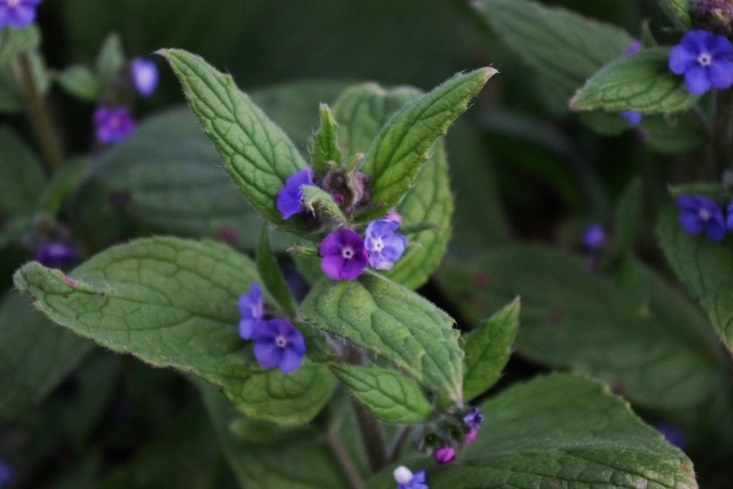 What was interesting though was that I noticed this week that a few established borage plants were displaying their normal blue flowers but there were also some unusual purple variants too.Who knows what this means? 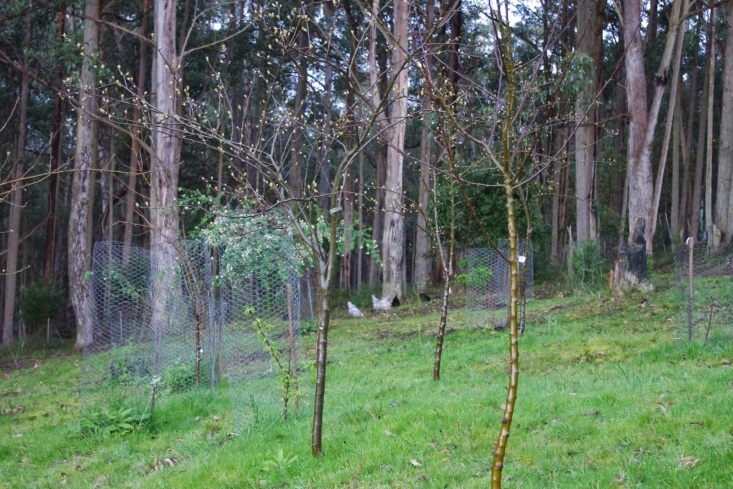 As both the air and soil temperature has risen in the past week, the fruit trees have continued to break their dormancy and the photo below shows some Asian pears and a Gala apple tree producing their leaves and blossoms. You can also see the chickens happily scratching around in the background too. Spring is a beautiful time here at the farm. The air is cool, the sun is warm and the green is gentle on the eye. 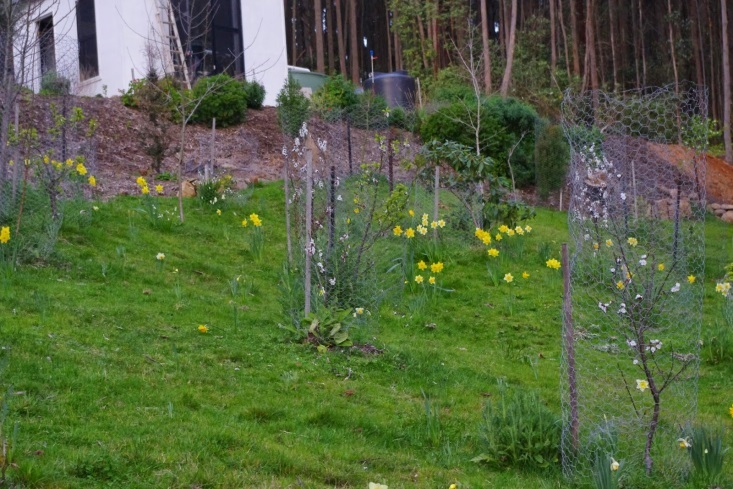 The daffodils, jonquils and snow drops are all happily enjoying the early warmth and sun. The herbage has turned a very deep green colour and it is really pleasing to look at too. A golden rule here is: that no soil shall be left exposed to the sun. In the photo above you’ll notice that there is a very dark brown patch below and to the right of the shed. This is because I’ve distributed a 50/50 mix of woody mulch and mushroom compost over the excavated fill. Generally my editor bars me completely from talking about soil, but given that she is currently elsewhere, I thought that it may be worth mentioning that this mix of toppings helps establish top soil quickly by providing both feed, bacteria and fungi which are all vital elements in a healthy top soil. There are already very hardy plants planted into that mix which hopefully will establish themselves over the next few weeks before the really hot weather kicks in. This past week has been a mix of both cloudy and sunny weather with temperatures most days were in the very low 20 degrees Celsius (68’F). The temperature outside here at about 7.30pm is 11.6 degrees Celsius (52.9’F) and so far this year there has been 583.4mm (23.0 inches) of rainfall which is up from last week’s total of 580.6mm (22.9 inches). Some weeks at the farm you feel like you are on top of the world. I mean that literally too. 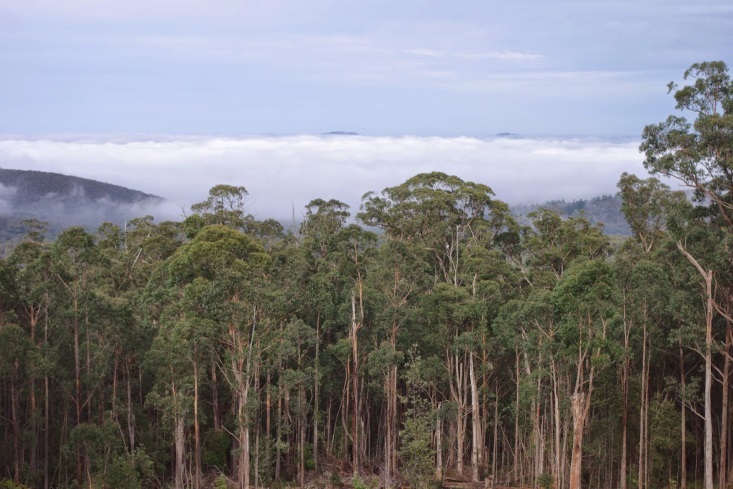 Spring and autumn always bring fog which rolls in from the Southern ocean. The farm sits on a mountain saddle about two thirds of the way up to the top of the ridge. Practically speaking this means that during winter, cloud can hover just above the tree line here for days on end, but below the farm people are experiencing severe frost. I’ve now been told that the recent snow and frost were some of the most severe in the past two decades. Had I known that fact in advance, I probably wouldn’t have complained to the local gardening group that the coffee shrub and babaco which are both tropical plants died here in the recent frosts. Things were much worse elsewhere. This morning however, I awoke to another fog and the mountains around the local area poked their heads out of the fog like islands in a sea. The deciduous trees are in the slow process of breaking their dormancy. 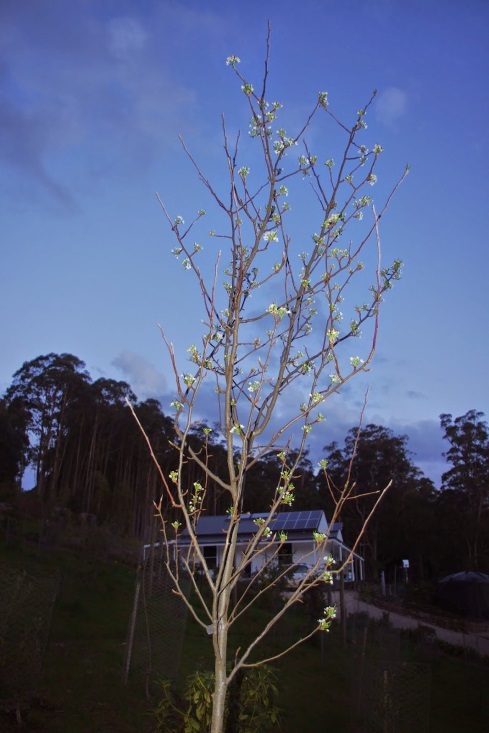 This week the earliest pear which is an ornamental snow pear, started to blossom and put on some leaves. The apricot trees which are now in their second year on the very sunny side of the orchard have put on even more flowers this week. Apricots are one of my favourite stone fruits and they are excellent for both bottling (canning) and for jam making so I look forward to getting harvests as the year’s progress. Not every fruit tree operates on the same annual cycle though. 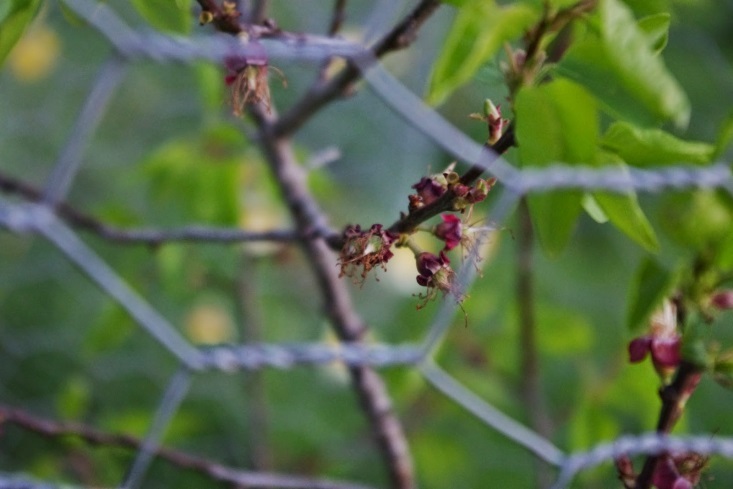 Occasionally the conditions favour a particular tree or variety and this year it seems that the almonds have set fruit really early, even whilst other trees are still dormant or only just breaking their dormancy. I have no explanation for this behaviour on the part of these fruit trees other than using it to justify the 300 different fruit trees here on the basis that something has to produce at sometime! In other farm news the final post for the blackberry enclosure was cemented into the ground over the past few days. The steel gate which is actually a recycled security door also received a lick of paint. The next step for the enclosure is for me to install the rails and then I’ll screw on the pickets which will be made from local saplings. 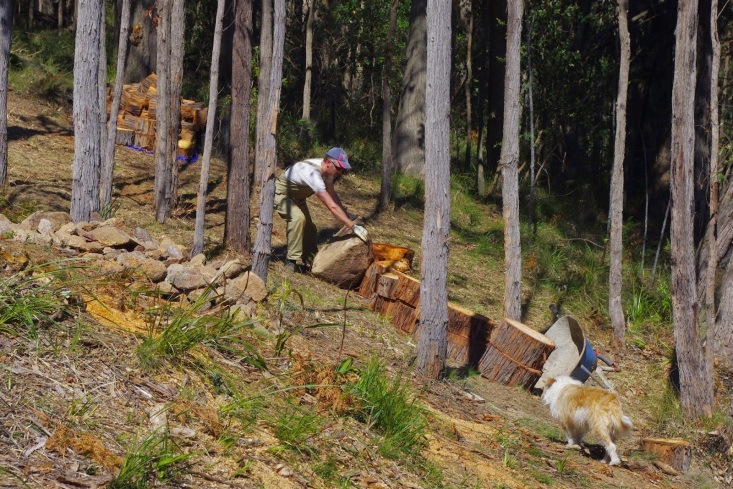 The mention of the local saplings brings the conversation around to the actual saw logs which I’d unfortunately stored in the middle of the area which I was using to accumulate fill from the recent excavations for the water tanks and new shed site. The reason that this was unfortunate was because I had to spend half a day sorting out the firewood pile and sapling pile before I could commence further excavations on the new shed site. Honestly the lower rock wall went straight through the middle of both storage piles and I had a groaning feeling that I had to sort out both piles before I could continue with the excavations. Sometimes the hardest thing here is admitting that you’ve stuffed something up and then getting on and fixing it. 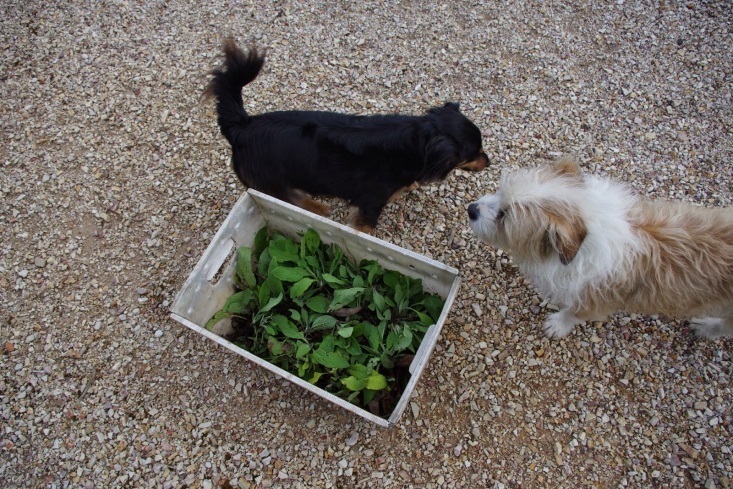 There has been some plant activity here at the farm this week. Fortunately, I live about half an hour away from a seedling farm so I occasionally drop by there to pick up a whole bunch of cheap seedlings. 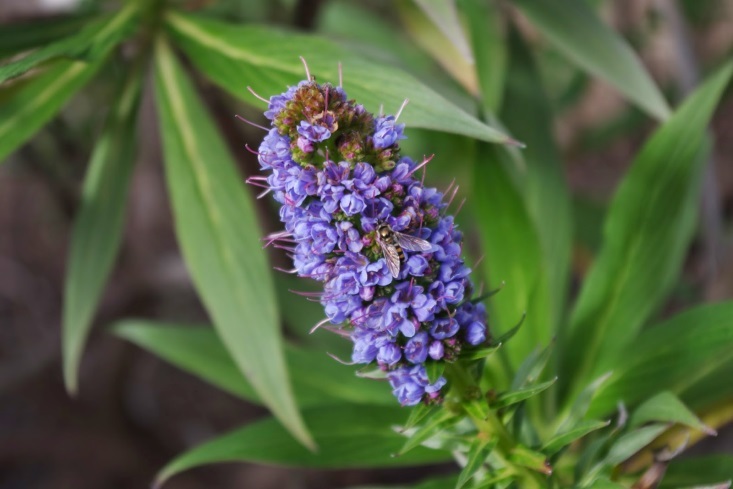 Nowadays, most of the seedlings that I purchase are hardy flower producing plants which attract beneficial insects to the farm. 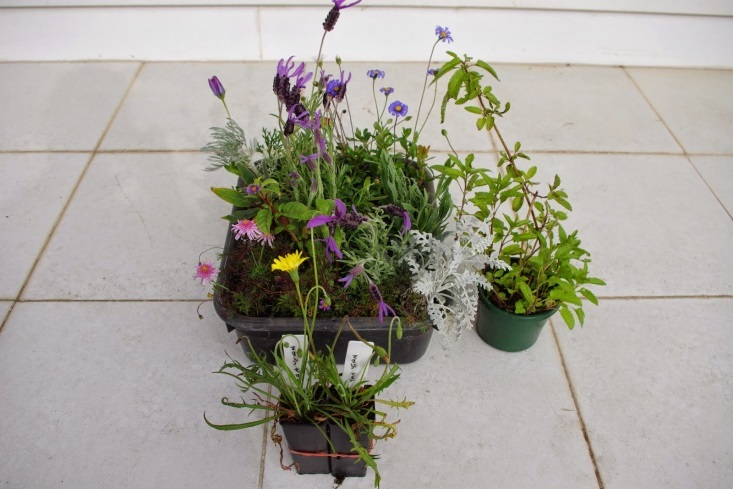 As a funny side story, a few years back I visited a local plant nursery and in the course of the conversation I happened to mention that I enjoyed planting flowers about the place. The nurseryman responded without even hesitating and said, “yeah, it is because you’re getting older!” I didn’t think that I was that old. Perhaps the appropriate response may have been, “yeah, whatever” but I guess I had to act my age. One of the objectives with plants here at the farm is to get as great a diversity of plants in the ground as possible. The climate here can be exceptionally variable throughout the year and also from year to year so a diversity of plants provides a level of reliability that wouldn’t otherwise be there if I’d concentrated my efforts instead on only a single crop or species. However, sometimes I come across the strangest plant communities (guilds) here which are really hard to explain. 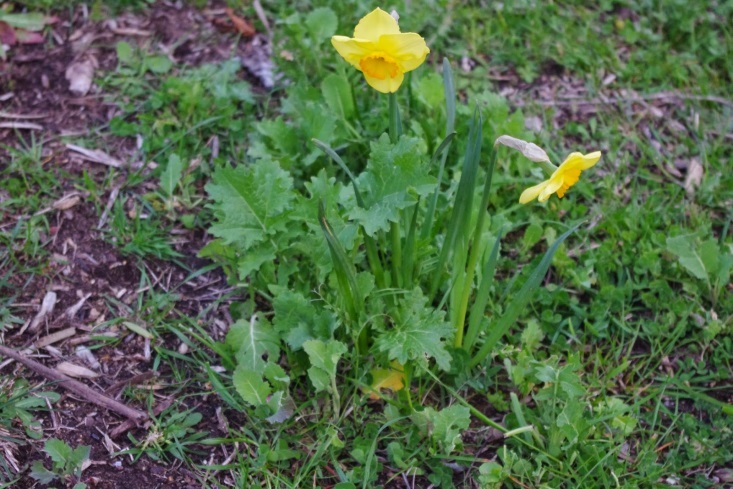 The photo below shows a very weird plant guild containing: daffodils; wild brassicas and vetch. It is important to observe how well they are all growing together, and it is such an unexpected surprise. I recently purchased a small quantity of red and black cherry tomato seeds from the Australian Diggers Club which supplies heirloom vegetable / fruit / herb seeds and seedlings. Despite having previously saved the best tomato seeds only a few months back, I thought that it would be prudent to hedge my bets and purchase some additional seeds as well. All of those seeds are now inside the house where it is warm and hopefully they will germinate sometime soon. 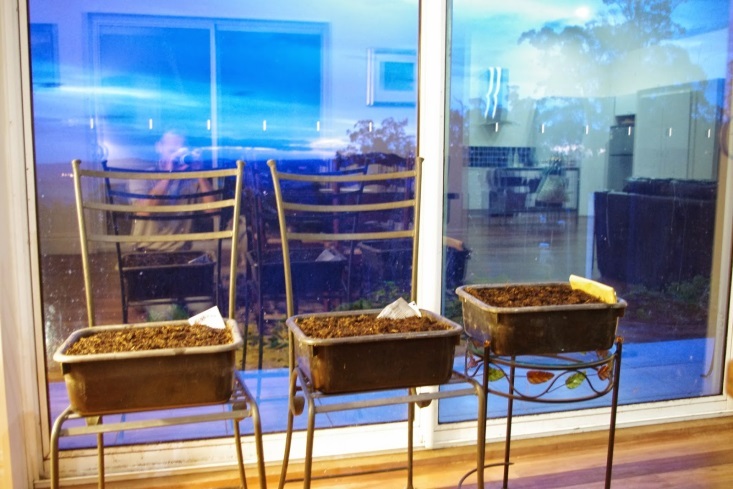 The common wisdom here with tomato seedlings is to have them outside and in the ground by Melbourne Cup day, which just happens to be the first Tuesday in November. 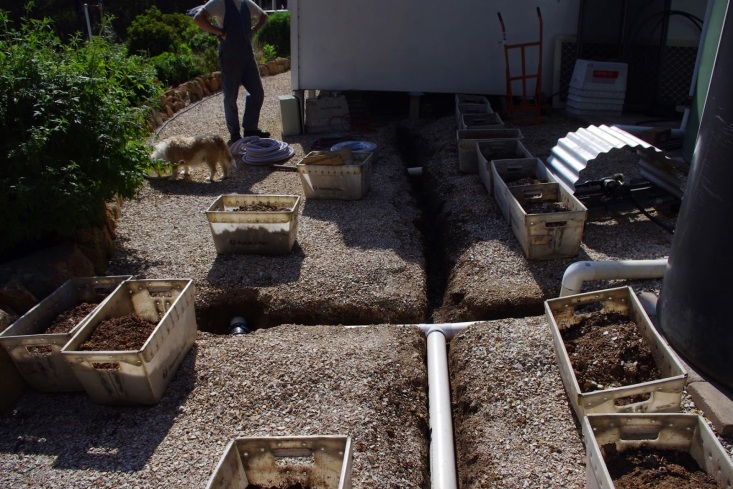 My understanding is that the soil temperature has to be above 15 degrees Celsius (59’F) and there must be at least 6 hours of direct sunlight daily onto the garden beds for them to produce fruit. I’ll let you know how the germination progresses. Tomatoes are a reasonable summer / autumn crop here and I usually harvest at least around 50kg (110 pounds) of fruit per year without too much effort. I’d like to put in a warning on the next paragraph for all of the plant lovers out there to simply skip the next paragraph completely. Apologies! One of the two old olive trees in a raised rock bed in front of the shed had been slowly falling downhill over the past year or so. I wasn’t too worried about the situation until I had to manoeuvre the water tank past that olive tree recently. The water tank simply didn’t fit past the branches of the olive tree. It was at that point that a cunning plan was hatched. The plan involved winching the olive tree over so that it leaned in the opposite direction. The water tank was then able to slide past the branches of the tree and all was good. I then started looking at the olive tree and thinking: how good would it be if the olive tree was vertical again? I then pulled apart the rock wall and stuffed a few more rocks under the lifted roots of the olive tree, packed in a whole lot more soil and then rebuilt the rock wall. After about a week I let the tension out of the nylon winch straps and the tree is now vertical. Remarkably the tree is still looking very healthy, so hopefully it will be vertical still in a few years time! On wildlife news, most nights I take my fox terrier out for a walk to see what is going on about the farm with the local wildlife. It doesn’t pay to let the local wildlife get too comfortable because a few days ago, I found a sulphur crested cockatoo eating the skins off ripening fruit on the citrus trees! Grrr! Anyway, last night’s walk was startling because there was a loud coughing sound not very far from me in the dark. At this point it is worth mentioning that not many of the wild animals here have pleasant sounding voices at night and most will produce sounds that send shivers up and down your spine. 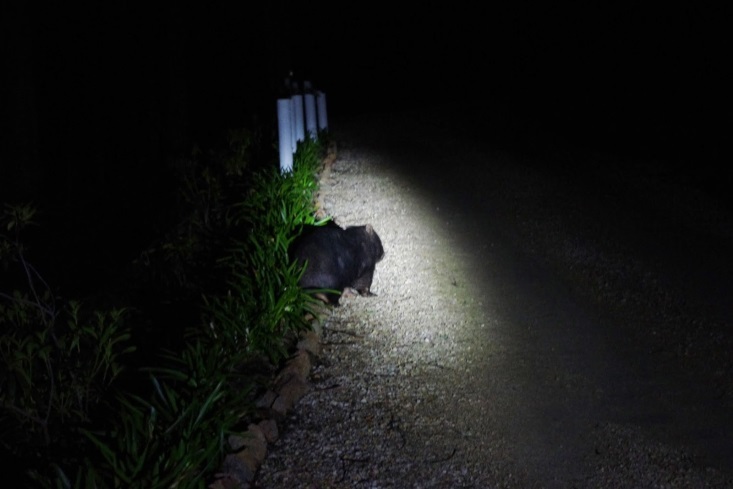 I grabbed the torch and the camera and the noise was found to be coming from a medium sized wombat ambling up the driveway. I think it was telling me politely to go away and stop bothering it. This past week has been both a sunny and warm week and temperatures most days were in the very low 20 degrees Celsius (68’F). The temperature outside here at about 9pm is 9.1 degrees Celsius (48.4’F) and so far this year there has been 580.6mm (22.9 inches) of rainfall which is up from last week’s total of 561.8mm (22.1 inches). The phone call came through on Friday from the supplier that the new water tank was ready to be picked up. 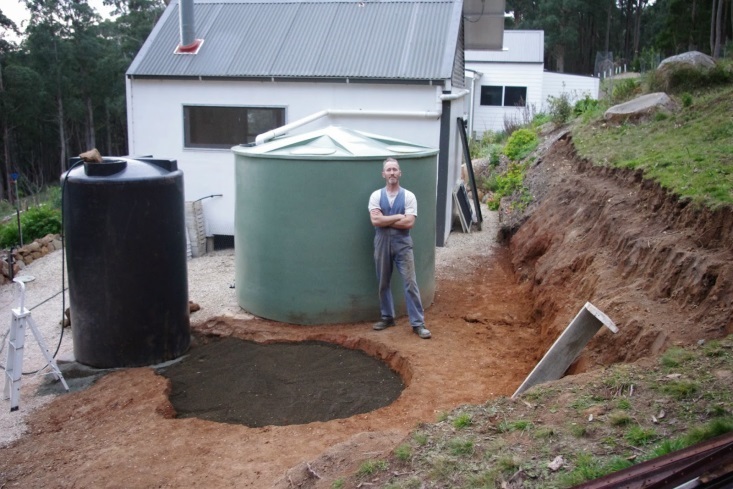 I couldn’t honestly say that the excavation site at the farm was ready for the new water tank to be installed on. Also, the truth was that when I received the phone call, I was several hundred kilometres (miles) away from the farm mucking around and generally enjoying the late winter sunshine. Still, I’ve been told that deadlines can be very motivational. So, for some strange reason, I told the supplier that I’d pick up the new water tank on Monday morning and for them to have it ready to go. I’m writing this blog from a position of hindsight and can only state for the record, that this was a serious under estimation of the sheer scope and size of the project. The funny thing about undertaking these sorts of projects is that I can honestly state that I had no idea how long it would take. I knew what was involved, but a truism keeps popping into my mind: Only when the job is complete shall you know how long it should take and what exactly is involved. Anyway, I spent a very long day excavating more clay from the water tank site. The day also involved marking out where both of the new water tanks would eventually sit and then ensuring that both sites were flat and free of sharp objects. To add a further complication to the project: each of the three water tanks were of slightly different heights so I had to ensure that all of the overflows were exactly the same height. The water tanks sit on beds of rock crusher dust which I picked up from the local sand and soil supplier. Rock crusher dust is a very fine granite dust which incidentally is also very good to add to your gardens if you have mineral deficiencies in the soil (apologies, the soil geek in me made me write that!). 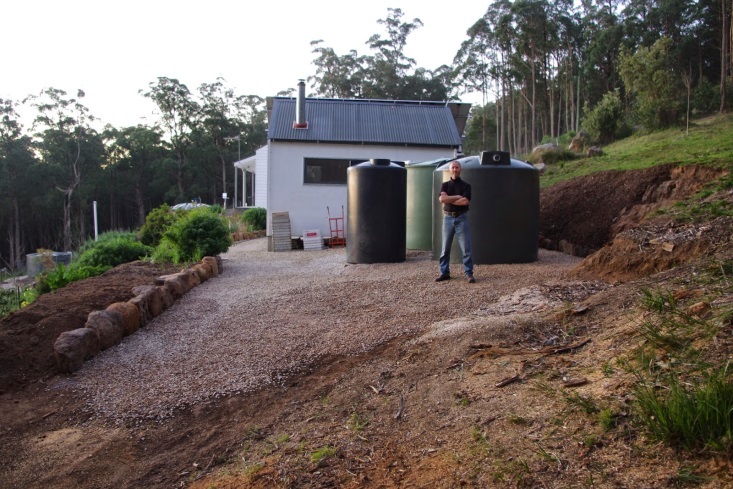 The photo below shows the new smaller dark grey water tank installed and being filled from the household water tanks. The large dark circle is the site where the yet to be installed water tank is to sit. The crazy hair was because I got up at dawn to start the excavations thinking that it would easily all be done by lunchtime. The photo was taken just before dusk on Sunday. Monday rolled around and I picked up the new water tank and drove it back here on the trailer. 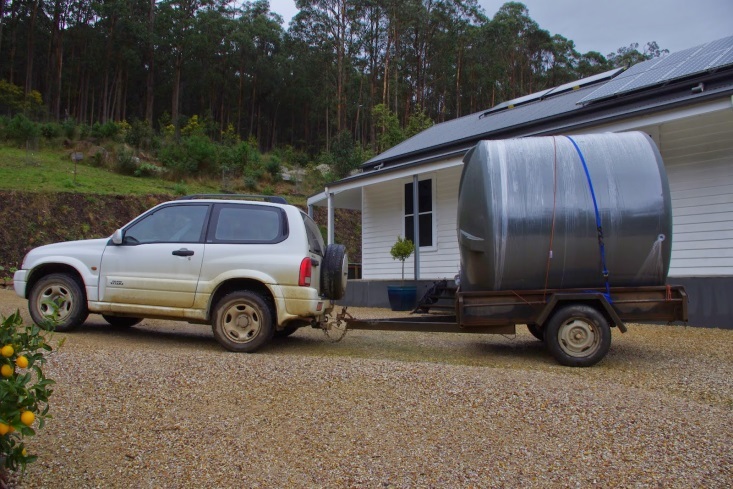 The water tank on the trailer almost dwarfed the trusty old Suzuki. A hand trolley helped move the water tank around, however it is worth mentioning that the water tanks weighs more than both my lady and I combined. It was not only really heavy but also awkward because polyethylene is one slippery material. 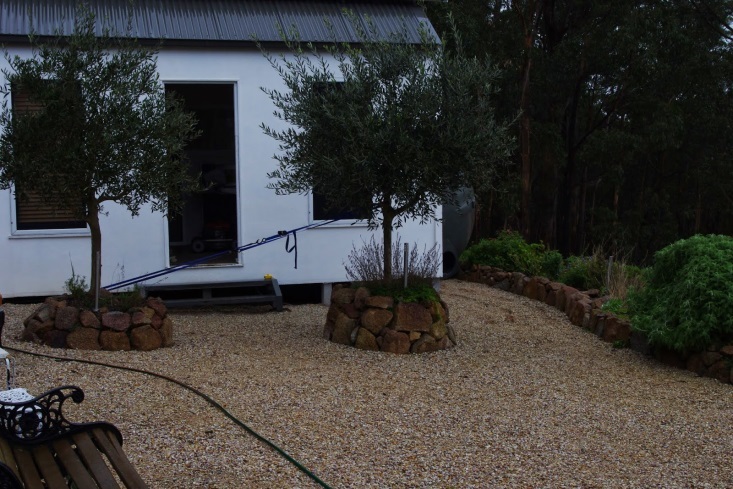 It was a bit of a struggle and at one point it almost didn’t fit through the gap between the existing shed and the bushfire sprinkler, taps, rock walls etc. 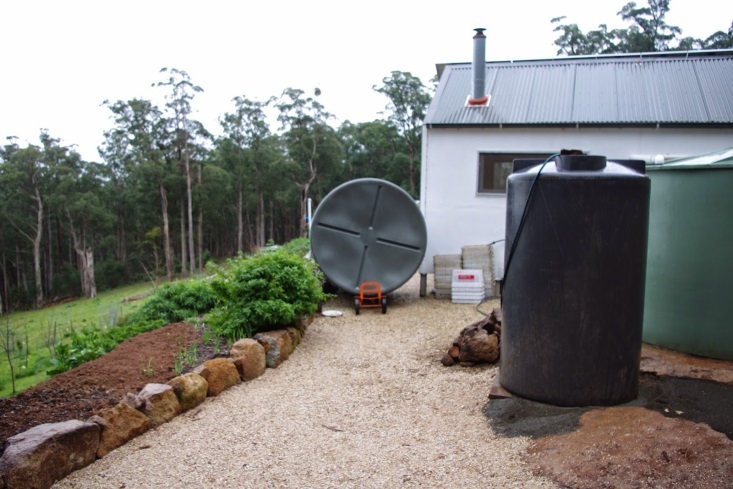 Eventually however, with a bit of ingenuity and a whole lot of brute force the new water tank ended up in the correct location and is – and still is at about 8.30pm – being filled by from the house water tanks. All was now well and I could relax and sit back with a good coffee! It wasn’t all about water this week. 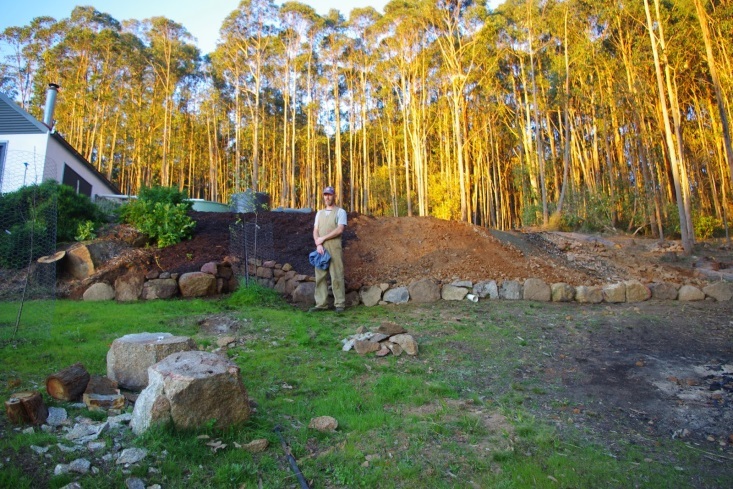 Have I mentioned that I’m seriously short of rocks for new rock walls? Don’t laugh, but peak rocks is a real problem here. 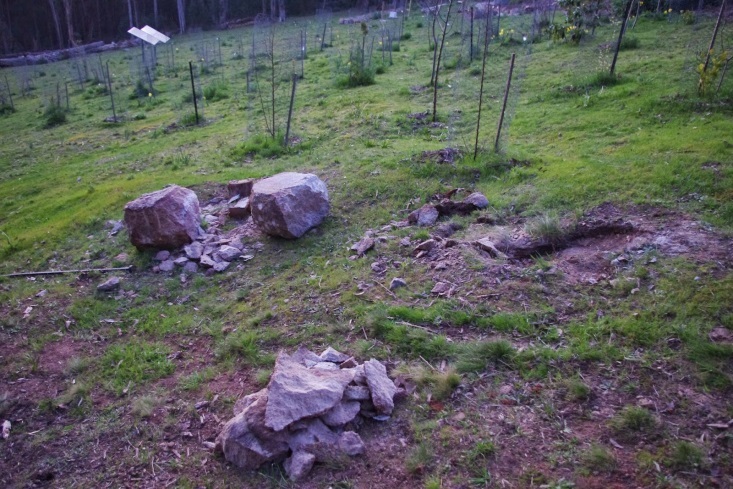 So last week a sudden burst of energy took hold of me I went out and started smashing up some of the few larger rocks in the orchard so that I could then move them into positions on the rock walls. 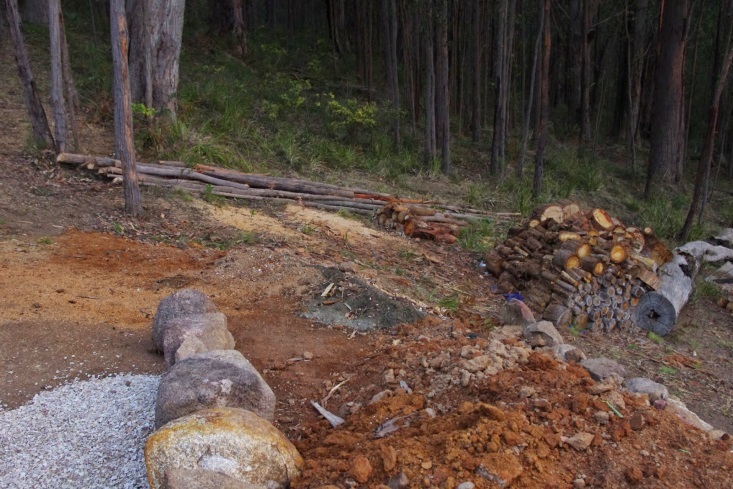 Thanks to that burst of energy, there are now two new very large rocks to move onto the ever expanding rock walls here. After a few hours of rock breaking, I could well understand why it is viewed as a punishment for chain gangs. 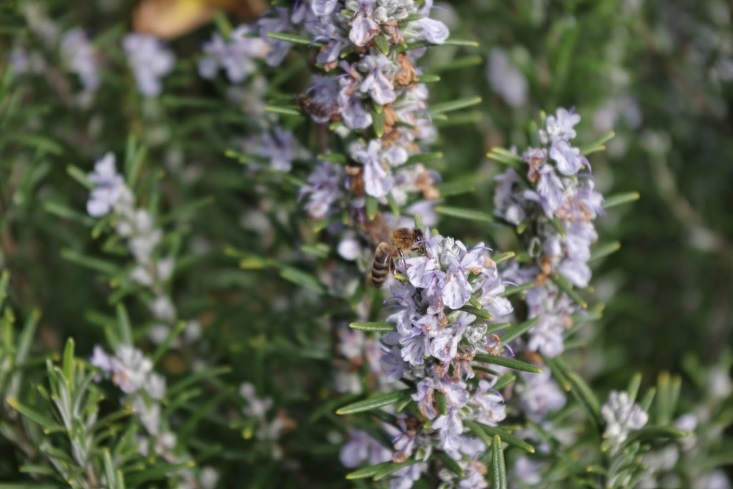 In breaking farm news this week, the European honey bees have returned from wherever they over-wintered. It is a pleasure to see them back at the farm, both in numbers and also looking healthy after having absconded from the farm last summer (a story of bee disaster). Still, my gut feel is that the bees know what is best for them and almost certainly know more about their requirements than I do! Not to be outdone by the Europeans, the native Aussie bees also made an appearance this week too. 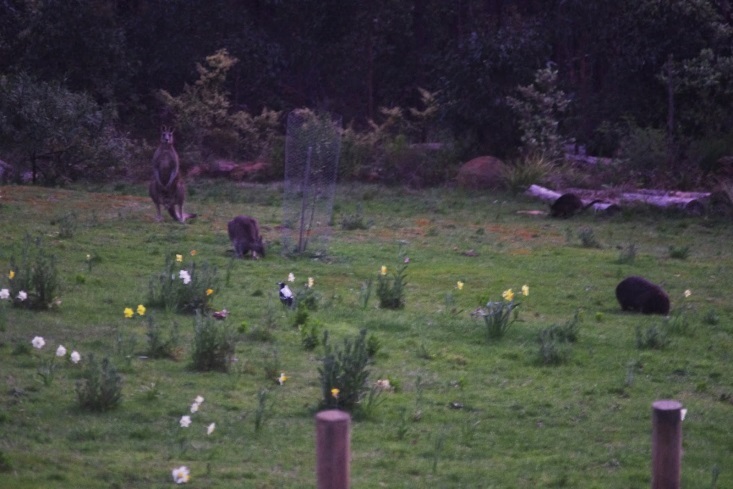 Big Daddy Roo has also been a frequent visitor here in the past few days. At well over 6 foot he is not to be trifled with. In fact, I believe he has some sort of agreement with the dogs here that they won’t notice him if he doesn’t notice them. Kangaroos are generally pack animals so it is strange to see a very large lone male roaming the forests here. He occasionally has a small harem, but mostly he is by himself. What may have probably happened to him in the past is that another large male fought him for dominance and won thereby evicting Big Daddy from his mob of kangaroos. Only he will ever know the full story though. Oh yeah, I mentioned that I’d been travelling last week. Well, back in 1938, someone decided to plant a forest of Californian Redwood trees in one of the wettest parts of the state here. That Redwood forest is just so different from the rest of the state that I thought that it would be worth sharing a short video. Hope you enjoy it as it is a very quiet, peaceful place that is rarely visited. This past week has been sunny and warm week for late winter and temperatures most days were in the very low 20 degrees Celsius (68’F). Today however whilst installing the new water tank (of course), it has rained for the entire day! The temperature outside here at about 9pm is 5.3 degrees Celsius (41.4’F) and so far this year there has been 561.2mm (22.1 inches) of rainfall which is up from last week’s total of 554.8mm (21.8 inches). 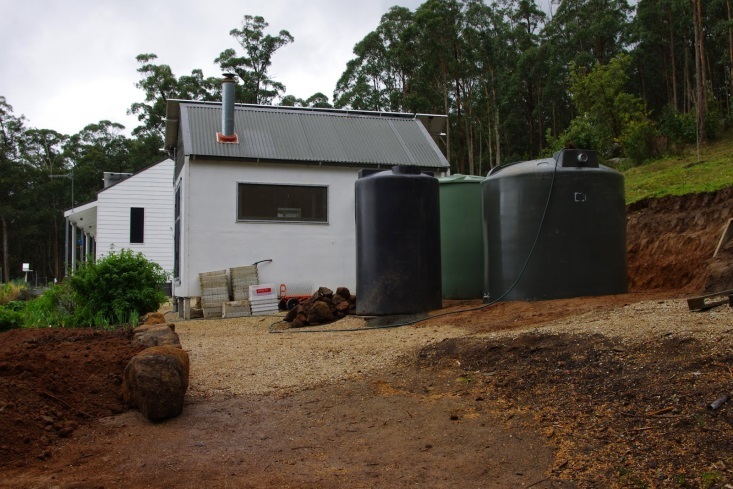 PS: As at 9pm both of the new water tanks are now full with water pumped from the main household water tanks.